The Accidental Locavore has noticed that unlike olive oil, where certain celebrity cooks have made us all crazy with the screech towards EVOO, butter has remained on the sidelines. Even though we all know butter makes everything better, it gets a bad rap in the fat department. And unlike olive oil, where the provenance seems to matter to an occasionally ridiculous degree, we don’t seem to get that particular about butter. Since I rarely bake, it never seemed to me that jumping to a better (i.e. more expensive, sometimes way more expensive) butter would make that much of a difference. Boy, was I wrong! 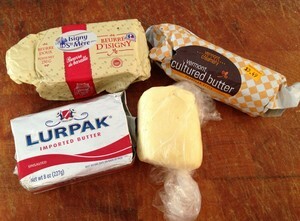 In what turned out to be a happy accident, I picked up a stick of Vermont Butter & Cheese butter. At first I didn’t think it was making much of an improvement over the usual stuff. Maybe it was just that in the winter, nothing is going to make vegetables shipped from faraway places taste better, but I couldn’t taste a difference. Then I used it in a batch of granola. In an instant, my normally pretty good granola (click here for the recipe), ascended to a whole new level! Easily the best tasting I’ve ever made! Recently, in the interest of research, I decided to do a taste test with a few different butters I picked up, mostly at Murray’s in Grand Central, and compare them to our standard home brand – Cabot unsalted – and make a batch of my own. But here was my conundrum: how best to taste and compare? I really didn’t need multiple batches of granola, or shortbread, or croissants, although any and all of them would be fine. Would toast be a fair test, or since it’s coming into season, asparagus? I finally settled on toast and in a very unscientific test, spread all of them on a couple of pieces of toasted white bread. Both Frank and I agreed that the winner was the French butter, followed by the Danish one, with my homemade butter third. To me, there wasn’t a huge difference and any one of them would work well. Again, if you’re baking, there may be a big difference. What do you think? Since I don’t bake, I have no idea about all this, but it’s really interesting! And all these butter nuances in baking are NOT going to send me rushing towards an oven! LOL! The water content of European butters is lower than those made in the U.S. which does matter in quantity baking. I do love the flavor of Euro butters more, but that (along with organic butters) changes with the seasons and what the cows are eating. Buy a good local butter and try it several times during the year (you could freeze them to taste side by side). Depending n your palate you can notice mild changes in flavor. I always love your posts, Anne! When I took a baking class several years ago the instructor demonstrated that for plaited doughs (croissant, for example), certain butters actually have a directional grain. It helps to increase/enhance the flakiness of the dough (or makes a half-hearted attempt into a winning result). I can’t tell you which are the butters that have this character but I’d wager they tend to be French . . . So interesting! I’ve always wondered it “better” butter is worth paying more money for. I’ve heard good things about Plugra, too, but haven’t tried it. Of course, if your standard butter is Cabot, that’s probably pretty good itself. Which I could get Cabot around here (Michigan). I’ve been very happy with Plugra…. Previous post: Recipes for Asparagus: Steam, Grill, or Roast and Enjoy!